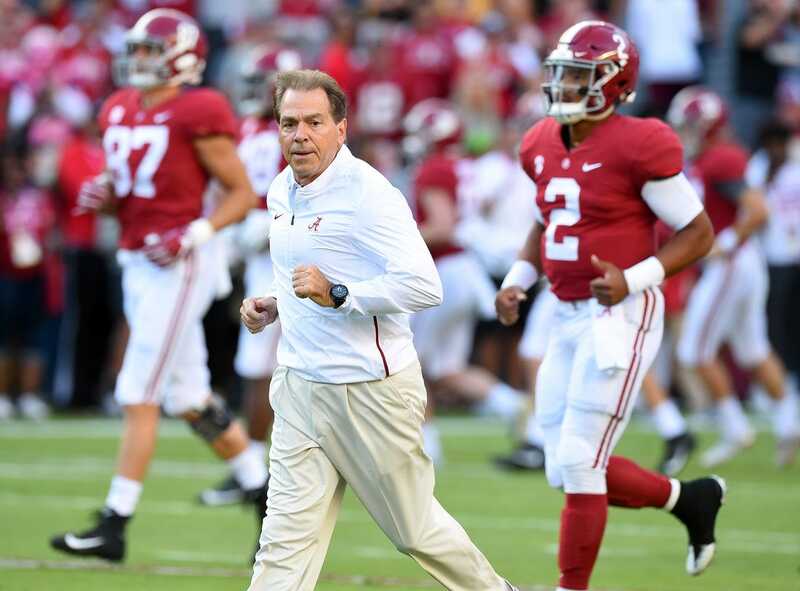 The Third Saturday in October -- the name given to the annual Alabama-Tennessee game - is here again, and the top-ranked Crimson Tide can proclaim a major historical edge. As one-sided as this series has become under head coach Nick Saban, Tennessee is a big underdog at home but coming off an upset at Auburn, there is some spring in the Vols' step. Alabama (7-0, 4-0 SEC) travels to Tennessee's Neyland Stadium to face the Volunteers in a 3:30 p.m. ET kickoff broadcast nationally on CBS. Saban expects his sophomore sensation quarterback Tua Tagovailoa to play in Knoxville after aggravating a knee injury last Saturday in a 39-10 win over Missouri. "Tua hasn't missed a day of practice and could have gone back in the game," Saban said on Monday in his press conference. "As long as the medical staff clears him, we'll keep working him to try to get him ready to play in the game." Tagovailoa (88 of 123 passing, 1,760 yards, 21 TDs, no interceptions) declared himself "fine" on Monday after practice. The two SEC schools - Alabama in the West Division, Tennessee the East -- are common inter-division rivals, and the series dates back to 1901 with the Tide holding a 55-38-7 advantage. Tennessee hasn't beaten Alabama since the Volunteers, ranked No. 7 at the time, won 16-13 in 2006 in former Tide coach Mike Shula's final season - the year before Saban arrived. Tennessee (3-3, 1-2) played well in the second half two weeks ago in a loss at Georgia, and that momentum carried over last Saturday on the Plains at Auburn. Sophomore quarterback Jarrett Guarantano passed for a career-high 328 yards and the defense forced three turnovers to help break an 11-game conference losing skid and stun their SEC West foe 30-24. The Tide rides a streak of 11 straight wins in the series under Saban, but Tennessee won 10 of 12 before he arrived in Alabama. A native of Rainsville, Ala., just south of the Alabama-Tennessee border, Vols first-year coach Jeremy Pruitt has served three separate stints as an assistant in Tuscaloosa under Saban, and his goal is to relocate the rivalry's success north of his hometown. "This game means a whole lot to a whole lot of people," said Pruitt, Alabama's defensive coordinator in 2016 and 2017. "We've got to do our part to create this rivalry again. It's not been much of a rivalry the last few years. "We've got to uphold our end of it." The Volunteers will have two key defensive players missing. Senior outside linebacker Jonathan Kongbo tore his ACL against Auburn. Middle linebacker Daniel Bituli, the team leader in tackles the last two seasons, will miss the first half due to a fourth-quarter targeting penalty.